While I’ve always been interested in toys that were educational as well as fun, having a developmentally delayed autistic child has spurred my interest in finding toys that help my both of children build necessary skills. Unfortunately, a lot of the general toy lists I’ve seen online suggest items which can inhibit skills, while the special needs lists often contain toys that my boys find boring. 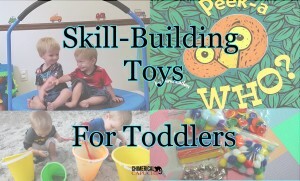 I wrote these lists to help parents find toys that kids generally love and will build developmental skills including gross motor, fine motor, imagination, and communication/speech. I based them off of recommendations from books and therapists, as well as suggestions from my friends. What’s wrong with the other popular play toys? Well, nothing is wrong with them, per se, it’s just that a lot of them aren’t open ended, which means that their use is limited. 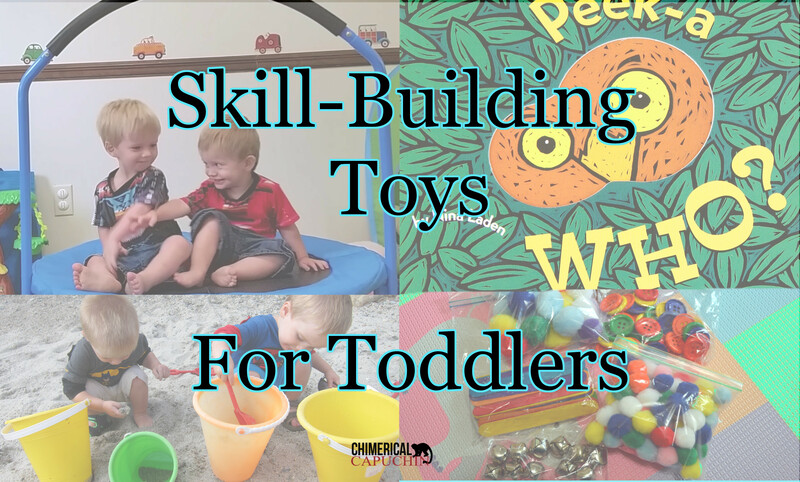 Not only do open ended toys encourage a greater use of developmental skills, but they tend to last longer and are still fun to play with even if a few parts go missing or are destroyed. Plus, a lot of the popular toys tend to make annoying noises. To help parents find the perfect items for their children I’ve divided these lists up by skill category and age. Since my boys just recently turned 3 and I only want to recommend toys we’ve personally played with, the age categories I cover are toddler and preschool, although I plan to expand as my boys get older. There are way too many items to list all of them. For each category, I’ll give general ideas as well as pick out our absolute favorites. A lot of these toys, like art supplies, really belong in multiple categories. For the age range lists, I’ll put it in just one. Gross motor toys are those that get your child moving! General ideas are swings, slides, play climber /house , push and pull toys, Basketball Set , kick balls, bowling set , Cozy Coupe , Bubble Mower , Sit ‘n Spin , gardening and digging tools, etc. If I could only guy one gross motor item, this would be it. The trampoline has been a great way for both of my boys to burn off energy on rainy days. We bought the Little Tikes 3′ Trampoline and have been very happy with it so far. My boys did gnaw off the protective covering around the bar pretty early on, but it hasn’t hampered our usage. If you do have very hyper boys like mine, I recommend putting the railing up towards the wall so they can’t tip it over. It may scuff the wall some without the railing, so put a piece of tape on the wall if you don’t plan to repaint when they are older. I asked my son’s physical therapist which bike she recommended for a child under 3 and she suggested a balance bike . Or a car that you push with your feet, known as a push pedal car . She started working with my son on pedaling about the time he turned 3. If your child has sensory issues, don’t make the mistake I did of just buying a bike. My son still refuses to ride our balance bike I bought for him over a year ago. The PT suggested that we go to a store a let him pick out a bike. He picked out a little tricycle which he ‘pedaled’ by pushing his feet on the floor. He may not have used it ‘correctly’ at first, but he enjoyed being on it and that mattered more. We also tried out a tricycle that the boys loved, but the positioning of the seat made it impossible for them to push with their feet. The link for the peanut ball goes to the small size, but unless you are starting out with a 1 year old, I’d get the medium ball so that your child can grow into it. For the exercise ball, I bought one to use for myself that ended up being a huge hit for our boys. They practice balancing on their bellies while I gently roll them forwards, back, and side to side to work on their core strength. We also play bouncing games where I sit on the ball and bounce with them. This is the Way The Farmer’s Ride, William Tell’s Ride, and Trot to Market are all fun games to play with babies and infants. 4. Shopping cart or large dump truck for hauling things around. 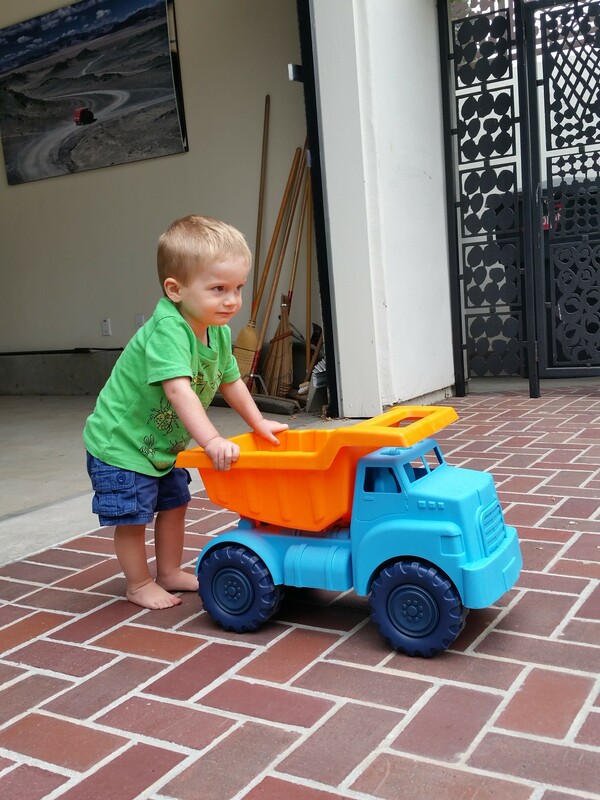 I don’t know what it is about shopping carts and large dump trucks, but at one of the playgroups we attend, they always seem to be in high demand, and my boys can’t get enough of their trucks. We have the Mega Bloks Large Dump Truck , the Tonka Classic Steel Mighty Dump Truck , and the Green Toys Truck amongst other trucks, but the most popular one by far was a cheap model made by Target that no longer exists. I think dump trucks are one of those toys were bigger is better. My boys have owned these giant for over 1.5 years now and they still enjoy them as much as always. They love to fill up the backs with things and dump them out. Great when they are helping me pick up pine cones. A pain when I’m trying to rake. My boys absolutely love digging in sand and it’s great for fine motor and gross motor practice. Since half of our back yard is wooded and there are stray cats in our neighborhood, I’ve had a really bad experience with a sandbox on the ground. Perhaps I didn’t purchase one with a tight enough lid, but either way, the sand got dirty very fast. 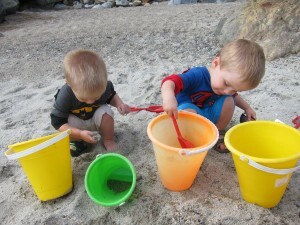 We’ve had a bunch better experience with our Step2 Sand & Water Table that has an umbrella and a lid. 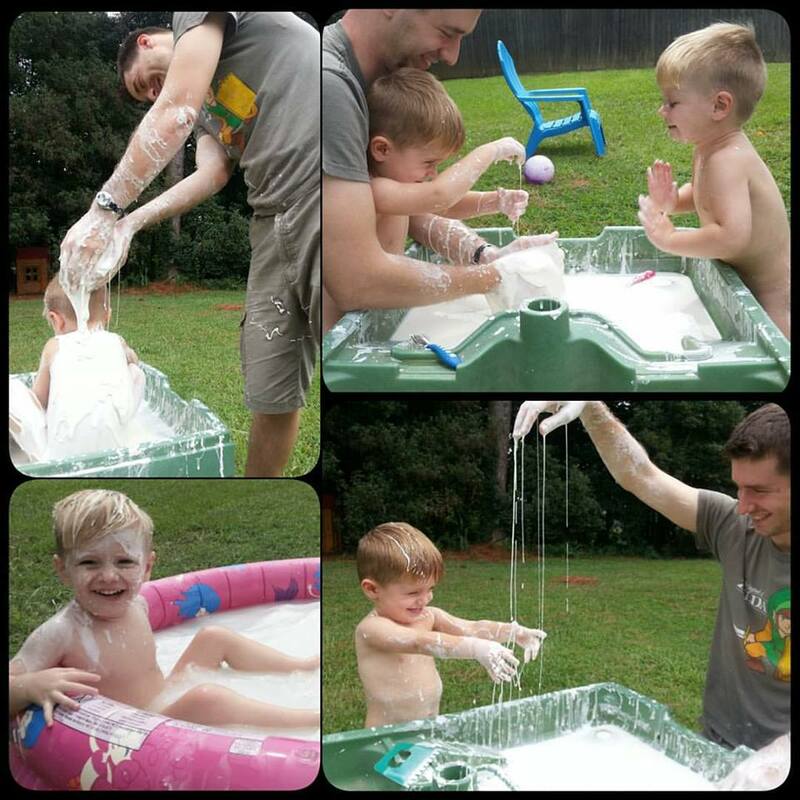 In the summer, I love to turn it into a sensory bin. 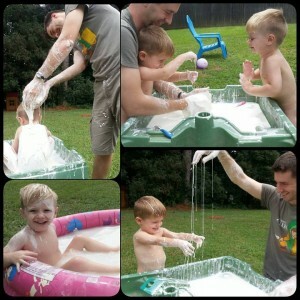 When we lived in an apartment, we used a long tupperware bin as our pool/sensory bin. It worked really well and you often can find them for cheap at thrift stores. Nesting blocks (this car set is amazing) or cups , stacking rings , geometric stacker , shape sorter , hammer and peg , bath toys that stick on the wall (you can make your own with craft foam), etc. I’m sort of cheating by throwing wooden blocks and building blocks together under 1 category, but they basically have the same function – building! For wooden blocks, as a nerd I have to recommend the Uncle Goose Periodic Table Blocks. They are bright, sturdy, and a great way to introduce your child to chemistry! Otherwise of these, we’ve collected all the rest of our blocks from consignment and garage sales. If you are trying to decide what to buy for building blocks, I personally found mega bloks first builders model outgrown too quickly. The pieces were too large to stack together in tall structures and my one son grew frustrated with them easily. Instead, I recommend starting with LEGO DUPLO or mega bloks Jr builder (the two are interchangeable) unless your child really struggles with fine motor skills. The Melissa & Doug First Shapes Jumbo Knob Puzzle is an excellent puzzle for very young children or those with fine motor difficulties. My boys also loved the Melissa & Doug Musical Instruments Sound Puzzle , which was one of the few exceptions to our “remove all batteries from toys” rule. One of my son’s first words was violin, which he called, “wee woo” from me mimicking the sound of a violin whenever we played with this puzzle together. Really though, the best puzzles are those that feature the items your child seems to love the most. One therapist brought over an interlocking puzzle featuring Disney’s Cars. I thought it was above the boy’s level at 2, but my one son fell in love with it and was soon putting it together. although the door thwangee (door stop) was the biggest hit of my homemade activity board, and helped the boys keep away from the ones in the house we needed to actually work. Learning resources has a great set of fine motor tools. Although I do not recommend this set for outdoor play. The temperature differences ended up breaking the droppers. For our next set, I bought cheaper regular droppers. For a toddler though, I think these jumbo ones are easier to use. As I mentioned earlier, I like to go to craft stores and purchase items after the holidays to use with upcoming craft. It’s not unusual to find pompom balls, pipe cleaners, tissue paper, jingle bells, etc on sale after holidays pass. The craft store is also a great place to just get fine motor items in general. Take an old container with a flat lid such as a coffee or oatmeal container. Punch holds in the top either in shapes or have the holes be the same size but ringed in different colors. 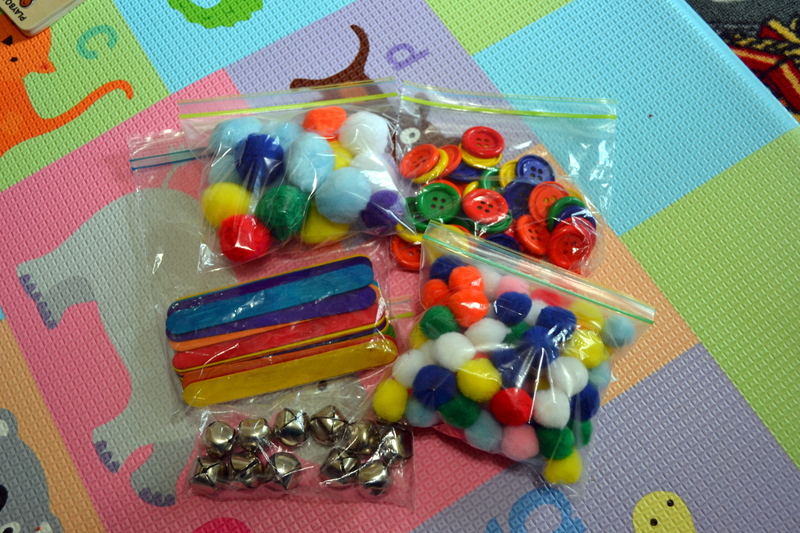 Now your children can sort their pompoms, popsicle sticks, buttons, etc. I also love these colorful Silicone Baking Cups to encourage sorting (they also make great snack cups and paint holders!). I also used the doll to discuss certain concepts when my boys were 1 and both had limited language. My one son was being aggressive towards me at times and I figured out that he wanted to rough house, but lacked the ability to put it into words. Taking our doll, I demonstrated the concept of rough and gentle with him. He got a kick out of this and soon was bringing me the doll as a cue to rough house. Not long after that, he managed to put it into words. With the doll you can also rehearse upcoming events or talk about events that happened in the past that might be problematic for your child. 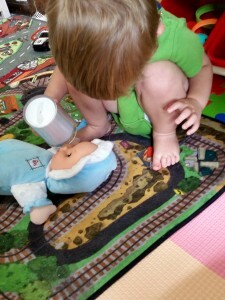 My autistic son liked to have his doll break a rule and then would lecture it, including separating it from the other toys when it couldn’t stop stealing other people’s toys. Our therapist said it was a way for him to work through his feelings. Crayons – The egg or triangular shaped ones are best suited for helping children develop that grip needed to hold a pencil or pen. You don’t have to rush out to buy anything fancy though. Small broken pieces of crayons work just as well. Not only does he paint more on the easel, but he’ll drawn more with chalk as well. Playdough – great for working on cutting, rolling into shapes, smashing, building stacks of cubes or balls, etc. There are many recipes if you’d like to make your own. Again, if you go to craft store and supermarkets after the holidays, you can often find Peeps on sale. They make a great edible playdough! 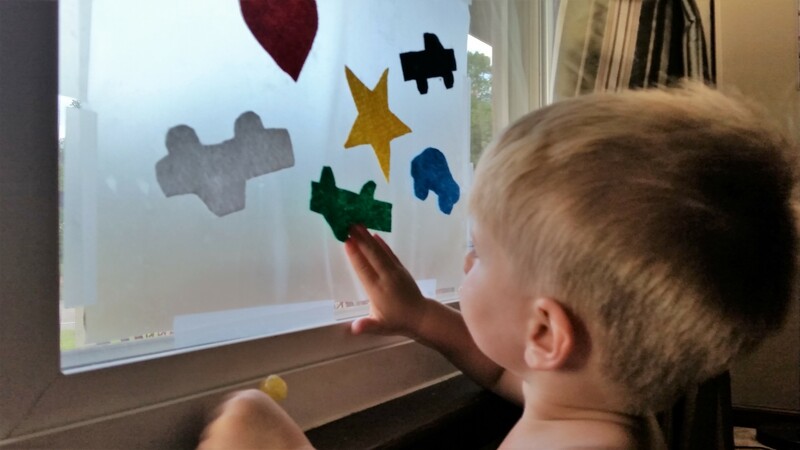 Dot markers – I’ve tried a bunch and these are the best. Used Halloween costumes are great substitutions to a lot of dress-up clothes and can often be bought at great discount after the holiday has passed. I also like to purchase character pajamas (neat Darth Vader set ) and jackets, which tend to be made of better material and last longer. Profession kits are things like play medical kits and they are wonderful to use when discussing things children might find problematic, especially if you pair them with your dolls and stuffed animals. We spend a lot of time playing with our various doctor sets before and after an appointment. I pretend to be the patient, I pretend to be the doctor, and I invite them to make their dolls and stuffed animals the patients. Although my autistic son hates the doctor’s office in general, this has gone a long way to helping him being OK with certain procedures and experiences. We also purchased a toy hair dryer with a real working hair dryer to help him with his fears of dryers and haircuts. The play food and shopping cart mentioned above can be used to rehearse going to grocery stores. We love our music toys! 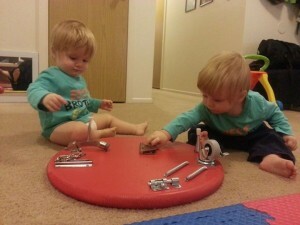 We have a drum set , trumpet, guitar, and a keyboard which only comes out occasionally, but is a great distraction toy! A lot of these items are cheap ones I bought at the dollar store. Now that my boys are 3, we are starting to purchase more realistic items, but if your children are like mine, you’ll want to wait until about 3 before giving them anything breakable. I had a lot of debate about if these toys should be here or in the preschool section, but since we started playing with them without a problem when my sons were 2, I decided to put them here. There are other sets we do love, but I found a bit frustrating at the under 3 age level. If your child is very delayed in fine motor, then you may want to hold off on these for now (or they might really help!). These are actually used by my son’s physical therapist as well. She puts them on a mirror and encourages him to cross the midline to reach them or walk up a little set of steps to pull them off the mirror. OK, I admit at the beginning I was having a lot of fun building the structures and my boys were mostly just requesting certain structures and pushing the completed structures around, but at around 2.5, they started building their own structures! Now, they do sometimes request me to make their favorites, but they spend a lot of time creating their own items without my assistance. 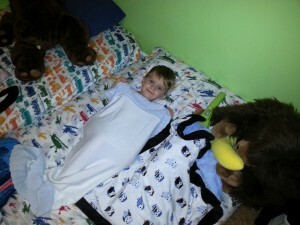 This is another toy that we learned about from our son’s Occupational Therapist. These thick pegs are much easier to use at this age than a traditional peg set. It held up remarkably well through two summers with lots of abuse. My boys did manage to break the cord, but the batteries still work in it. We’ve been very impressed with the duration considering how many times it’s been knocked about. 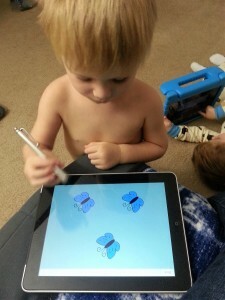 Bubbles taught my son to point and really opened the door to communication for him. There are a lot you can do with bubbles beyond just chasing them down. You can blow them in different sizes, in different directions, and towards body parts. You can count them with your child as you pop them and send you child jumping for them to work on gross motor. Also good for fine motor skills, fridge magnets in letters, numbers, or animals/people are great tools for building communication. 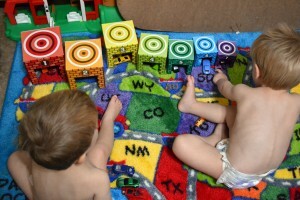 When my boys were pre-verbal, we sorted them by shape, color, and matched the letters together. Once they started speaking, then we would play various games together and sing songs based on the magnets. My one son loved me to spell out EIEIO on the fridge and sing Old MacDonald. although we did take the batteries out of both. 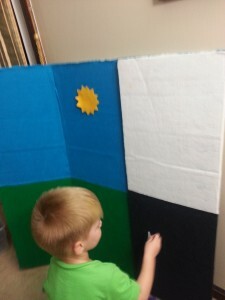 I made mine, but busy parents can purchase various felt play sets . To make mine, I took a large poster board and covered both sides in felt to create two different background scenes. Here are my favorite books for building fine motor skills and communication/speech. Peek-A Who? is a book that my boys still enjoy at 3, but were absolutely obsessed with when younger. It’s repetitive and simplistic, but I think that’s what they like most about it. As I explain in my speech series, for children with speech delays, it’s best if you speak to them about their level. So, if they only say 1 word at a time, then you try to keep your speech at 1 or 2 words to really help them. This book has Peek-A on every page with a different last word, so it’s absolutely perfect for the pre-speech crowd. Once they grew older and started talking more, then we explored the pages in more details, but in the beginning, it was just this book with me making silly voices. There are a whole series of these books that are full of bright, large pictures of the items. You can get ones on the farm, dinosaurs, general words , first 100 words, trucks , animals, rescue vehicles/people, trains, and lots of other subjects. My boys still enjoy reading the truck books. You can’t go wrong if you find a book of you child’s biggest fascination. My autistic son enjoys reading the vacuum cleaner manual. Another great simplistic series, the That’s Not My… has a mouse trying to find a specific object or animal. As he looks around, the pages state “That’s not my… It’s [X] is too [Y]!” until he finds what he’s looking for. You can find ones featuring dinosaurs, trains, kittens , lions and other animals and items. Lots of touch and feel pages for your children to explore with their fingers. While I haven’t read all of them, my boys love One, Two, Buckle My Shoe , Do Cows Meow? , and Where’s Boo? (great for Halloween) among others. Her pictures are colorful, the books engaging with flaps for children to explore, and the subjects are ones my boys enjoy. Along with Sandra Boynton , Salina Yoon is the most common author I see recommended by speech therapists. Pat the Bunny has lots of different textures to explore as well as encourages children to use their fine motor skills. Preschool, gross motor, fine motor, imagination, and communication/speech lists coming soon!